Watch Lucas Esper Berthoud, and "For the longest time I wasn't a professional player—just a hobbyist," Lucas Esper Berthoud said. Well, less said and more recalled with pinpoint accuracy. Looking back from Mythic Championship I in Cleveland, he said "Two years and one month ago I was just playing PPTQs. Every now and then I would qualify for a Pro Tour. That was perfect for me. Then I won Pro Tour Aether Revolt in Dublin." It was a win that unlocked a world of change for Berthoud. "Platinum status and qualification for a bunch of other [Mythic Championships]. A switch went off in my head: 'I have to become the best player I can be.' I'll be facing the very best out there. It's my chance to prove I belong." The self-projected chip on his shoulder is at the forefront of Berthoud's reflections on professional Magic. "I had a very good last season, and then I found myself qualified for the Magic Pro League. Now, with the MPL, the mindset is the same but turned up to eleven—even more intense. It's a competition of the best of the best. If you're someone that likes to play great games, there's been nothing like that in the history of the game. If it makes your brain tick—and your heart pump—playing against other great players and trying to beat them, then there's nothing like the MPL." Lucas Esper Berthoud wants to be the best—something some Planeswalkers will always embody. "I have two goals. I came out of nowhere, and I won Pro Tour Aether Revolt. It was cool and all, but I also felt I needed to prove I belonged—that I wasn't a one-hit wonder," Berthoud said. "It's a small chip on my shoulder. With the MPL, it didn't really change. I don't think most people would put me on the same level as the more recognizable names." "So I want to beat them." Berthoud's quest to win wasn't just toward nebulous "victory"; he knew exactly where he wanted to start. "I want to beat Andrew Cuneo. I want to beat William Jensen. I want to beat Owen Turtenwald. I want to beat Reid Duke," Berthoud said, rattling off a litany of the game's titans all for one reason. "I want revenge for last year's Team Series—I want to beat Ultimate Guard Pro Team. We should have beat them that day. We were ahead on Pro Points. It was our championship to lose." Berthoud summed it up succinctly. "I want revenge." The Mythic Invitational—and the MPL more broadly—leans into MTG Arena as the platform of daily play and competition. 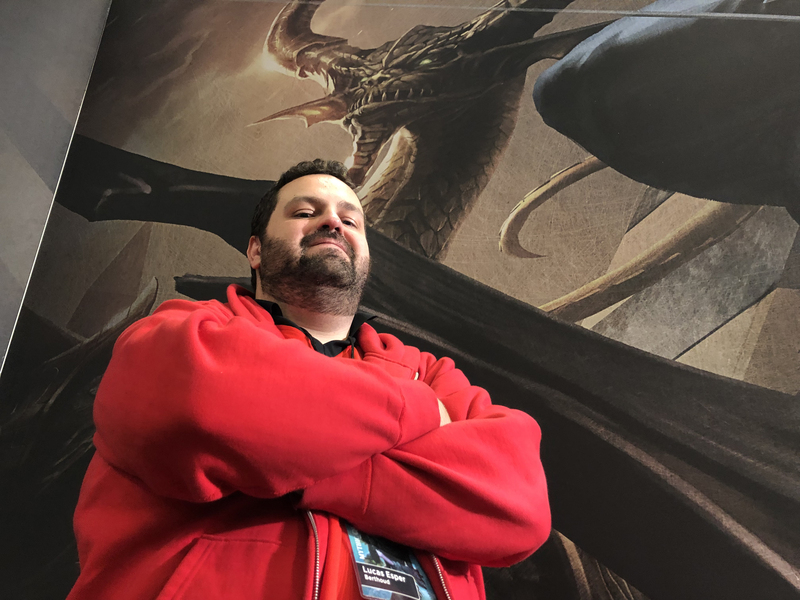 The arrival of MTG Arena has been a transformative moment for professionals, both MPL members and Mythic Championship competitors alike. "Now, you get to play so many games. So, so many games. It's pretty incredible," Berthoud said. "If you want to test a matchup, you can play a few hours and have a good idea how it's going to play out. If you want to test a brew, you can do it quickly. With ranked play, you're always playing someone at your level. It's a game changer." And with the MPL and more streaming, Berthoud is confident preparation is inevitable. "There's no excuse; you can turn on Twitch and see how Matt Nass plays out testing. You have access to all the information. You have access to all the games. All the tools are there." In contrast to many other MPL players, Berthoud is pursuing the league—and events like the Mythic Invitational—alongside his existing career outside of Magic. "It's gonna be a busy year. I'm keeping my day job alongside the MPL," said Berthoud. "I really appreciate my career outside of Magic. Most players have Magic as a hobby. Dedicating 100% of the time to Magic is very rare for players. With the MPL, I want to show you can be smart about how you play—how you prepare—and you can still compete." But that split focus is exactly what Berthoud is all about. "That's how I've been playing the last couple years, and it's worked out. I want to keep doing that. You always have to have balance in life. I feel better when I have more than one interest." While the Mythic Invitational is a much more select group, testing for the Mythic Championship was fresh in Berthoud's mind—and he recounted how he's attacked it, like other tournaments, for the past two years. "I feel like I have an important role in my playtesting group. We have some of the best players in the world, but also players that qualify other ways," Berthoud said. "For me, it's very, very important to welcome those players and give them a chance. Willy Edel gave me that years ago, and I feel like I have to repay it forward. Offering testing, arranging their travel—I feel it's very important to me because if I'm at a tournament and my teammates are doing well, I feel better. It's an investment in my happiness." That investment in the Magic community is what Berthoud wants to exemplify now. "I want people to look up to MPL players, not just for being good at the games but for the stuff they do for the game. How they give to their community. I want to be a good ambassador for the game." Happy for @lucaparroz_ on another RPTQ trophy. On saturday we focus practiced a difficult matchup and figured out an unconventional sb plan. He beat that matchup twice on sunday. My two highest PT finishes were practicing with him, glad to return some of the favor. Berthoud will have his next chance to defeat his Mythic Championship Team Series nemeses—and support his Latin and South American comrades—at the Mythic Invitational in Boston during PAX East, March 28–31. Tune in to twitch.tv/magic to watch him—and all the other invitees—compete for their share of the $1 million prize pool!